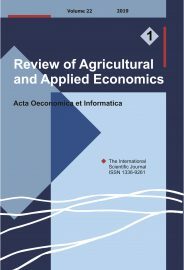 The international scientific journal Review of Agricultural and Applied Economics (RAAE), the successor of the Acta Oeconomica et Informatica (AOEI) ISSN 1336-9261 is an open access journal that provides publication of scientific articles in all areas of the subject twice a year. For the purpose of double-blind review, we request that you remove all references to your paper and all downloadable versions from the Internet. If you are not able to remove them, this will not affect the processing of your paper, but it does mean that the RAAE is not able to guarantee you a double-blind review. New submissions are sent to two independent, anonymous reviewers, selected by Editorial Board members and the Editors, for judgement on their appropriateness for publication in the RAAE. The recommendations of the refereeing panel are made known to the authors by the Editors. Revised articles should be sent directly to the Editors in the same way as first submissions (e-mail address: editors@roaae.org). A covering letter (rebuttal letter) which identifies, point by point, how revision requests have been met (or if not, why not) has to be attached. When an article has been accepted, the Editor will inform the author(s) in which issue of the RAAE it will be published. On submission, an article receives a manuscript number. This number should be quoted in all correspondence relating to the article. • Immediate Reject after pre-review screening. After submission, all papers undergo a pre-review assessment by members of the editorial team based on the following criteria: 1. Does the paper fall within the broad remit of Review of Agricultural and Applied Economics (RAAE) in having an explicitly applied focus with clear application to the journal topics? 2. Does the paper contain sufficient scientific approach for the RAAE? 3. Is the scope of the paper broad rather than narrow with the potential to make a substantial advance in the development of applied ecology, and/or does it provide novel methodological insight? 4. Is the subject area covered by the paper topical and novel, and hence potentially of interest to a wide readership? 5. Are the design, methodology, data quality and analysis of a standard appropriate for peer review by the Journal? 6. Does the paper conform to Journal standards with respect to length, format and language? Papers submitted to the RAAE Journal will be rejected without review because they fail on one or more of these criteria. In some cases, authors will be invited to resubmit their paper once the problems have been addressed. The aim of pre-review is to identify papers that have the potential to make novel, interesting and significant contributions of direct relevance to the RAAE topics. We aim to aid authors by identifying papers that do not have the potential we are looking for, and by returning these papers as quickly as possible so that the publication process will not be delayed. Rejecting papers at pre-review that are unlikely to make it through the peer review process ultimately saves everyone time and reduces the burden on our referee community and editorial system. If a paper is not rejected at the pre-review stage it goes forward for peer-review. Typically, each paper is reviewed by two independent referees and an assessment is made by the RAAE editors. The final decision is taken by editors based on the information gained through the peer review process. • Reject. Following peer review, the paper is judged not to be acceptable for publication in Review of Agricultural and Applied Economics (RAAE) and resubmission is not possible. • Resubmit. The submitted version of the paper is not acceptable and requires major revision but there is clear potential in the work and the RAAE is prepared to consider a new version. Authors are offered the opportunity to resubmit their paper as a new submission. Concerns will remain regarding the suitability of the paper for publication until the editors are convinced by the authors that their paper fits the scope and standards of the Journal. The resubmitted manuscript will be returned to the original editor if at all possible. Resubmissions should be returned within 4 months of receiving our decision letter. • Revision. The paper requires changes before a final decision can be made. Authors are asked to modify their manuscript in light of comments received from referees and editors, and to submit a new version for consideration within 3 weeks of receiving the decision letter. A point-by-point explanation of how comments have been addressed must be supplied with the revised version of the paper. Revisions may undergo further peer review and papers may undergo more than one round of revision. If the authors do not revise their papers to the satisfaction of the editors, the paper can still be declined from publication in the RAAE Journal. • Provisional accept. The paper is acceptable for publication, subject to conditions that need to be addressed in producing a final version of the manuscript. These may include sub-editing changes and minor amendment to ensure the paper fully matches our criteria. At this stage we will request an exclusive licence to publish, supplementary material, figures in separate files, colour artwork. • Final accept. After final checking by editors, acceptance is confirmed and the paper is published in EARLY VIEW, later the paper will appear as a part of Online published RAAE issue. Proofs. PDF proofs are sent to authors for proof reading and correction by the Editors and a date for return of proofs will be given; corrections arriving after the stated date will only be incorporated if time is available in the production schedule. To submit your manuscript, first place the Title page and Paper in two WORD files making sure that all author identification is removed from the paper itself so that anonymity can be preserved in the review process. A separate title page must be sent as an attachment to the editors by e-mail and should include: (a) title; (b) author(s) names; and (c) name, address, phone and fax numbers, and email address of the author serving as the contact person. Due to the double-blind review process used by the RAAE, authors should only provide their identity on the title page of manuscript. Please add to the Title page four (4) experts in the field as potential reviewers of your manuscript. Please include their names, mailing address and contact information (affiliation, phone number and e-mail address). (see Template1). On the submission of your manuscript, please suggest four (4) experts in the field as potential reviewers. Please include their names, mailing address and contact information (affiliation, phone number and e-mail address) to the TITLE PAGE file of your manuscript submission. Requirements for selection of reviewers: – maximum one reviewer can be suggested from the home university of the authors; – reviewers must be professionals from the field; – reviewers should be researchers with publications in indexed scientific journals; – co-authors of the manuscript are not accepted as reviewers. It is important to keep the editor informed of the corresponding author’ current postal and e-mail addresses, and the telephone number. Articles must be written in good English. Please assure that at least one sentence of text occurs between any two headings (in particular, a section heading should be followed by at least some text preceding any subsection heading). One space all material, including footnotes, references, and tables, on A4 standard-weight paper form. Use 10-point Times Roman type style. Do not use any predefined text style. All headings and subheadings are flush left. Provide short headings for each section and subsection. Do not number sections or subsections. Section headings are denoted in bold and subsection headings, in italics. Do not indent the first paragraph after any heading. Do not indent the first paragraph of the article. Follow the instructions in Template2. Authors are expected to document their data sources, models, and estimation procedures as thoroughly as possible, and to make the data used available to others for replication purposes. If an exception to this rule is desired, reasons should be given and this should be explicitly noted in the Title page. Use only essential mathematical notation written using Word Equation Editor. Avoid using the same character for both superscripts and subscripts or using capital letters for such, and whenever possible avoid overbars, tildes, carets, and other modifications of standard type. Asterisks, primes, and small English letter superscripts are suitable. Equations should be typed on separate lines and numbered consecutively at the right hand side, using Arabic numbers in parentheses (1), (2), etc. Please use italics for scalar variables, use boldface to specify vectors and matrices, and use script for sets. The most notable exceptions are function names (e.g. sin, cos) and physical units, which are all typeset with the normal (upright) font. Subscripts and superscripts must be easily distinguished from regular variables and from each other. Use only two levels of sub- and superscripts. Fractions: When equations in the text contain fractions, use a slash “/” or solidus and clearly denote numerator and denominator with parentheses. Display fractions that are too complicated to keep in the text on a separate line. Units: The metric system is mandatory and, wherever, possible, SI units should be used. Abbreviations and Acronyms: Equations should be referred to by the abbreviation “Eq.” and the respective number in parentheses, e.g. “Eq. (14)”. However, when the reference comes at the beginning of a sentence, the unabbreviated word “Equation” should be used, e.g. : “Equation (14) is very important for the results. However, Eq. (15) makes it clear that…” The abbreviations “Sect.” and “Fig.” should be used when they appear in running text followed by a number unless they come at the beginning of a sentence, e.g. : “The results are depicted in Fig. 5. Figure 9 reveals that…” If acronyms or abbreviations are used throughout the article, they should be defined at first occurrence, e.g. : Quality of Life (QoL), National Science Foundation (NSF). If these names or concepts are also mentioned in the abstract, they should be defined there as well. Capitalization: In addition to proper nouns, capitalization of the first letter is applied for titles, section headings, figure and table legends but only for the first word. Abbreviations and expressions in the text such as Fig(s)., Table(s), Eq(s)., Theorem, etc. should always be capitalized when used with numbers, e.g., Fig. 3, Table 1. The words figure(s), table(s), equation(s), theorem(s) in the text should not be capitalized when used without an accompanying number. Non-English Words and Phrases: Foreign words that have not come into general use are italicized. Words, phrases and abbreviations referenced in the Webster’s are not italicized. For example, “et al., cf., e.g., a priori, eigenvalues”, should not be italicized. Please avoid using footnotes. If a footnote cannot be avoided, use the footnote function in Word. Footnotes should be only explanatory and not for citations or for directing the reader to a particular work. Such information can be incorporated into the text. Place References, alphabetized by author, in a list at the end of the paper, one and half spaced (without extra blank lines between references). Provide issue number whenever possible and always for journals that do not number pages sequentially through complete volumes (e.g., for Journal of Economic Perspectives). Format reference with hanging indentation (first line flush left, second and subsequent lines indented). Only cited works may be included in the reference list. A unique digital object identifier (DOI) is assigned to every article of the RAAE. All citations should appear in the text and contain the authors name and year, with page numbers when necessary. Citations can be inserted parenthetically, e.g. (Doe, 1985). If the author’s name is used as part of the sentence, include year of publication parenthetically, with page numbers if necessary; e.g., Doe, Smith and Jones (2002) show that . . . . . Use et al. only with four or more authors. For text citations listing more than one source, separate sources by a semi-colon: (Doe, 1998; Smith and Jones, 2000; Smith, Jones, and Erp, 2003; Thomas et al. 2004). Do not use et al. in the reference section. Tables should be included in the text file, near to the text that refers to the table. The table should not duplicate information in the text of the paper. All tables should have a concise title. Footnotes can be used to explain abbreviations. Citations should be indicated using the same style as outlined above. One space all material and omit vertical rules in tables. Each table and figure must have a legend. Place legends for tables at the top of the table and flush left. Table and figure titles should be fully descriptive. Omit a period at the end of the legend. Capitalize only the first letter of the first word. Tables should be simple and should fit on one page. Figures should be integrated into the text of the initial submission. The initial submission file should be uploaded with text and embedded figures in Word (Excel) editable format. Do not use picture format. Normally figures do not carry footnotes to specific items within the figure. General explanatory information may be included in a paragraph bearing the heading of “Note:” and placed below the figure legend. Place legends for figures at the bottom of the figure, flush left. Capitalize only the first letter of the first word. The aim of the figure legend should be to describe the key messages of the figure, but the figure should also be discussed in the text. Each legend should have a concise title of no more than 15 words. The legend itself should be succinct, while still explaining all symbols and abbreviations. Avoid lengthy descriptions of methods. Publication of accepted manuscripts is free of charge. The RAAE is copyrighted. Authors will be required to sign a Licence to publish form, when manuscripts are accepted, which will prohibit publication of material contained in the article elsewhere unless specific permission is granted by the editor(s). Please note that by submitting an article for publication you confirm that you are the corresponding/submitting author and that RAAE may retain your email address for the purpose of communicating with you about the article. You agree to notify RAAE immediately if your details change. If your article is accepted for publication, RAAE will contact you using the email address you have used in the registration process. Please note that RAAE does not retain copies of rejected articles.